Once every year, the Perseid meteor shower returns. Each year, the Perseids are an excellent meteor shower, and are possibly the most popular meteor shower. They are often very fast and bright, and can sometimes leave fiery trails in the sky. The Perseids are called so because of their apparent origin, called the radiant, in Perseus. Each meteor you see is actually a piece of the comet Swift-Tuttle. This comet leaves behind a trail of dust and debris every time it orbits the sun, thus refreshing the source of the Perseid meteor shower. This year's Perseid meteor shower will be at its most active peak on the morning of Tuesday, August 12th, 2008. 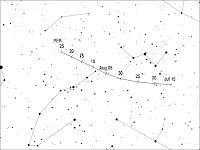 The Perseids can be viewed any time between August 8th and 14th, however, since their peak is so broad. A good time to start viewing them would be Monday night (8-11-08) into Tuesday morning (8-12-08). Look to the North and Northeast to see the most meteors. Unfortunately, the waxing gibbous moon will be up for this event, which will wash out all but the brightest meteors. The moon will set at 2 AM, allowing observers an uninhibited view of the Perseids if they're willing or able to stay up that late! This is the best time to view meteor showers, as the Earth is rotating into the shower in the predawn hours. This will increase the meteor rate considerably. With good, dark skies (after the moon sets), expect up to 100 meteors per hour. Of course, light pollution and moonlight may decrease your observed meteor count. August 8, 2008 - Perseids start. August 11, 2008 10 PM - Good time to start viewing. August 12, 2008 2 AM - Moon sets, viewing improves. August 12, 2008 7:30 AM - Actual peak. August 14, 2008 - Perseids taper off. For more updates like this, subscribe via our RSS Feed or via E-Mail! Thanks for the great info... Only one thing what time zone is this based on... Don't want to miss it. The times given in this post are general times and independent of time zones. So whether you are in the US Eastern time zone or in the US Pacific time zone, it will be your local time. Since the meteor shower will be going on all night, the time you can see it depends on your time zone. August 11,9:46 my mom saw some early before that time,but I think the real good stuff is gonna start soon since the time is 9:49. get ready!!!!!!!!!!!! Well, the peak passed last night. I got up at 2 AM to watch as the moon set, and I saw maybe ten before the clouds set in. can I see in Indonesia, jakarta. And what time? is this happen every year?? That is correct, the Perseids return every year around the same time.